Note: 1200 pounds was the figure given for the Touring car with others in proportion. The bare chassis weighed about 960 pounds. * Fiscal year, October 1, 1913 to July 31, 1914. ** Ford News, Nov. 1, 1920, gives a figure of 248,307. ENGINE SERIAL NUMBERS: 408,348 to 656,063 calendar year. 348,736 to 670,000 approx. model year. MODEL YEAR DATES: August 1913 to January 1915 approx. BODY TYPES: Touring, Runabout, Town Car, and Chassis. MAJOR MODEL YEAR FEATURES: Steel panels over wood framework (standard until 1926). 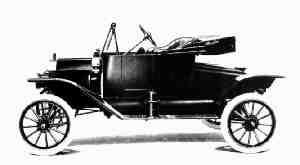 Touring was similar in style to the 1913 but doors were smaller, inset in the side panels, and had rounded bottom corners, setting the style for all future Model Ts. Door handles were now inside the doors. Body panels now folded over the top edge, making the separate cover piece used in the 1913 bodies unnecessary. The windshield now folded to the rear with its support straps bent to clear. The Runabout was similar in style to the Touring. Rear turtle now had rounded corners. Chassis frame now had longer rear cross-member, eliminating the forged body brackets used earlier. The metal coil box, made by Ford, but using coils of K-W design, was standard. UPHOLSTERY: Imitation leather replaced all real leather. No real leather was used by the end of the year except on the front roll of the arm rest. FENDERS: Front: Same as later 1913, with embossed bead on the apron, and across the wide part of the front fender. Had no front bill at first but the bill was reinstated before the end of the year. Rear: Similar in style to the front. Support irons were now attached to the body framing, extending out the side of the body, through a hole in the apron of the fender, and were clamped to a single plate under the fender. SPLASH APRON: Same as 1913. Fenders and aprons were painted black. RUNNING BOARDS: Pressed steel with embossed diamond pattern. The Ford script now ran across the board. Made in USA appeared on all boards. HOOD: Aluminum, with no louvers. Hinges were separate from the panels, and riveted in place. Hold-down clamps had two ears and were of forged steel. Handles were forged steel. DASHBOARD (Firewall): Wood, with flat brass edge trim. Board now mated with the body side panels. CHASSIS: Same as later 1913 with the longer rear cross member. Painted black. STEERING COLUMN ASSEMBLY: The major portion of 1914 models used the same column assembly as on the 1913 cars. The change to the one piece gear box apparently came late in the year, or in early 1915, with some overlap where both types were used in production. Brass-plated spark and throttle levers, with flattened metal ends. Wheel is 15 outside diameter, wood, and painted black. The wheel spider was iron and painted black. FRONT AXLE: Same as the 1913 cars. REAR AXLE: Cast center section, same as 1913, and with the axle tubes flared and riveted to it. This axle then continued into early 1915. DRIVESHAFT HOUSING: Pinion bearing spool was a casting and was held by studs and nuts, the studs being enclosed (not visible) in the housing. Integral front housing for universal joint assembly replaced the two-piece style (apparently during late 1913). REAR RADIUS AND BRAKE RODS: Brake rods had forged ends and the support brackets were of the type which go out and wrap down around the rods. Rear radius rods no longer had the forged forks. The fork is created by splitting the rod and flattening it. WHEELS: Used 30 by 3 tires in front; 30 by 3-1/2 in the rear. Original tires had no tread, but tread began to appear on the rear tires. Hub flanges were 6 inches in diameter. Front wheels used ball bearings. Hub caps had Ford in script letters. Made in USA on all caps. SPRINGS: Tapered-leaf, front and rear. Figure eight style shackles. RADIATOR: Supplied by Ford with the standard Ford script. Made in USA on all radiators, under the Ford script. ENGINE: Closed valve type as in 1913. Serial number above the water inlet. Press-in welch plugs replaced pipe plugs to seal the water jacket on the right side of the engine. Flat-top pistons were replaced with the beveled edge type. OIL FILLER CAP: The mushroom-shaped cap, of brass, with six flutes and the Ford script appeared on all models. Made in USA added. Steel replaced brass early in the year. ENGINE CRANK: Aluminum formed handle, painted black, initially. The steel sleeve assembled type began to be used during the early part of the year. ENGINE FAN: Driven by a leather belt from a pulley at the front of the engine. The fan hub was brass (bronze), with the blades riveted in place. Adjustment was by means of a bolt/nut arrangement now located on the right side of the front plate and bearing against a boss on the mounting end of the fan bracket. MANIFOLDS: Exhaust pipe flared at the manifold and was held in place with the brass nut but with no packing. Intake was aluminum, then cast iron in the same pattern, and finally the standard-design (less curved than the 1911-1913 types). CARBURETORS: Kingston four ball or Holley Model G.
CARBURETOR STOVE: Several designs, all of which rose vertically at the rear of the carburetor and mated with the exhaust manifold at the rear area. MUFFLER: Cast iron ends, mounted with brackets integral with the end castings. Exhaust pipe extension integral with the rear cover plate and no longer tapered or bent. Wrapped with asbestos, secured with three steel straps. The asbestos was no longer to be dyed black during 1914 production. FUEL TANK: Cylindrical, under the front seat. Mounting brackets now clamped to the tank. Outlet was between the center and the right side, between the frame rails. TRANSMISSION: Three pedal standard-design. Pedals were marked with C, R, and B. Transmission cover was cast aluminum, but now had reinforcements around the bolt holes at the widest part. Tapered inspection door, held with six screws. The door was a plain metal plate with no script. COIL BOX ASSEMBLY: Ford, all metal, with one-piece flat top cover. The Ford box used the standard-size coils. The coils themselves had brass-plated tops. HORN: Bulb type, single twist. Black and brass style. WINDSHIELD: Standard. Bottom section leaned back and top section was vertical. Painted black. Top section folded to the rear. Support brackets now had a bend to clear the top section as it was folded. TOP: (Open cars). Top color was black on all open cars. Top irons the same as 1913. SPEEDOMETER: Stewart Model 100, but larger than the 1913 type. Last year for speedometers as standard equipment, and a number of Ford Specials appeared. TURTLE DECK (on Runabout): Similar in style to the 1913 but with rounded corners. Handles were brass but painted black. GO TO 1915 © Bruce W. McCalley. Rev. Januaty 26, 2007.